Like plenty of comics fans, I was impressed by the relaunched Valiant Comics a couple years back. Their stories were fleet and well-written and they did a fantastic job at pairing up writers and artists that were appropriate to the story being told. I wrote up each new Valiant release, and found their entire core line to be solid and well-made... but I never fell in love with a Valiant title until I read The Death-Defying Doctor Mirage. 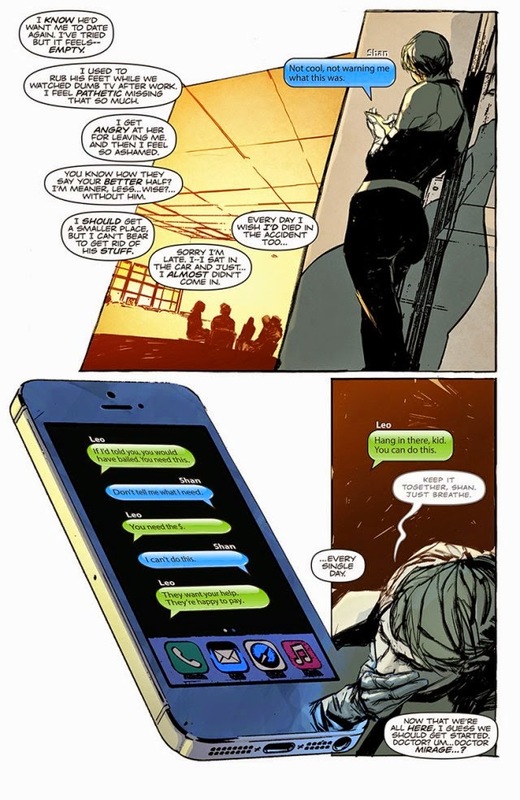 The Death-Defying Doctor Mirage follows Shan Fong, a psychic who is capable of seeing and speaking to the spirits of the deceased, but she remains haunted by the one ghost not present: her late husband. Together, the two roamed the world as exorcists and demon-hunters, but when he died on the job, his spirit vanished completely. When a reclusive billionaire named Linton March hires her to help him break his binding to an ancient demon, she finally has a chance to find her husband and potentially free his spirit from its prison. As I mentioned in my review of The Valiant, the company's books all have a peculiar relationship with time, with loss, with the sins of the father echoing down generations. It's been interesting to see the variety of ways their writers found to examine those themes, but mostly, for me, in an academic way. The Death-Defying Doctor Mirage personalizes those ideas, introducing us to a group of characters trapped by past loss and old mistakes trying desperately to overcome them. Divorced from the demands of the typical superhero narrative and grounded in powerfully portrayed grief, these themes come alive in new ways. It's a premise anyone can relate to, and writer Jen Van Meter does a fantastic job at layering each subplot with similar ideas. Van Meter's work here is excellent all around. It isn't easy to comfortably pace a story in short, 22 page chunks, but Van Meter manages to do so not just with Shan's current quest, but with two running subplots that end up colliding wonderfully in the series' climax. Indeed, because of that pacing, her relationship with her late husband Hwen is given enough room to breathe that makes its payoff genuinely heartfelt, one of the rare romantic relationships in comics that feels like a meeting of genuine equals. Doctor Mirage is one of the great new(ish) comics characters of the decade, a mature heroine capable of diving headfirst into the unknown. The series doesn't work without artist Roberto de la Torre. He uses everything - angles, perspective, and especially shadow - to infuse the early issues with a sense of powerlessness. Shan is a woman barely holding on when the series opens, so de la Torre gives us a lot of wide shots, making her a small figure engulfed in her environments, and angles that make her seem smaller. As the series progresses, she begins to stand straighter, her face is covered in shadow less often, she's illustrated from angles that make her feel powerful, maker her dominate the frame. Without a word spoken, we understand: Shan must overcome her grief and become a full person again, become the superhero she used to be. It's a powerful metaphor told gorgeously through de la Torre's art. Meanwhile, David Baron's colors are downright chameleonic, often changing radically on the fly to set the appropriate atmosphere for the scene. In the first issue, Baron uses the full range of colors, but mutes them - it's realistic while still dictating the book's funereal tone. 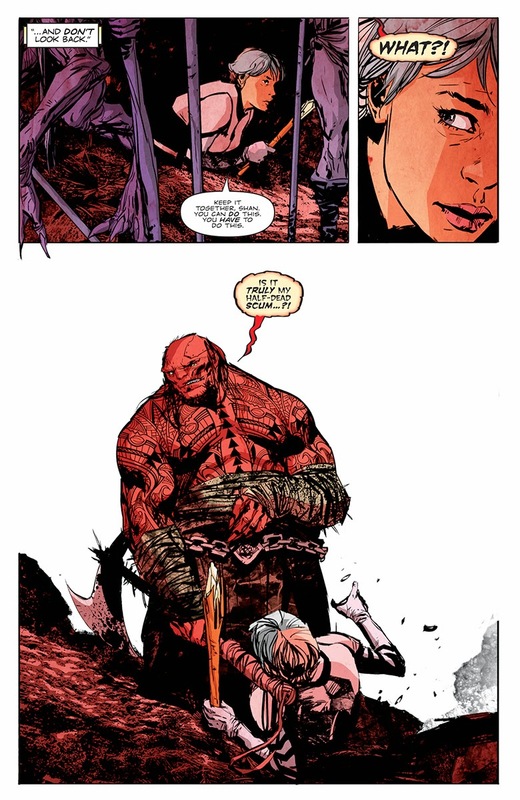 But as the series slips further and further into supernatural worlds, the panel-by-panel color palettes swap more, get more monochromatic, though even there they maintain the haunting, elegiac feeling of that first issue. It's a subtle way to highlight the way the real-world characters often only feel half-alive, matching them evenly with those already in the afterlife. But like de la Torre's art, the colors evolve over the course of the series, slowly coming to balance as Shan rediscovers herself. 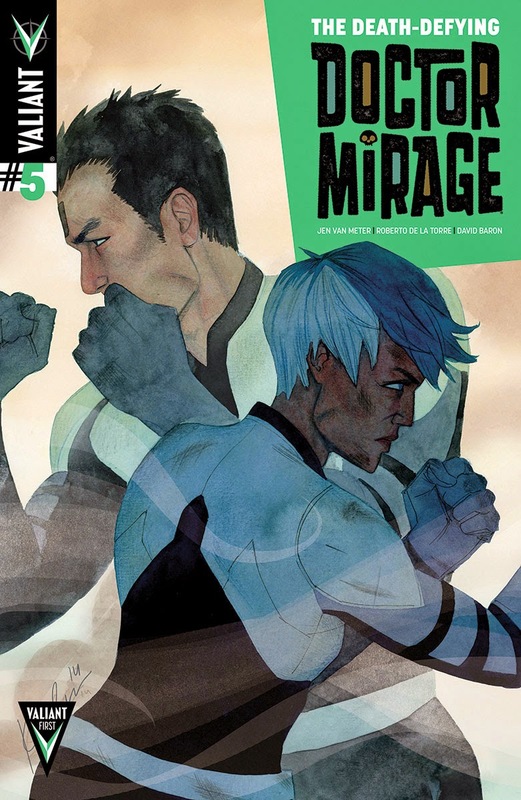 Valiant typically makes good books, but with the recent conclusion of The Death-Defying Doctor Mirage, they have become a company that can make truly great ones. As 'Valiant Next', the second wave of new titles that will push the metaplot of their line in interesting new directions, gets underway, I sincerely hope to see them take more risks like this - and I hope they don't let go of a team as phenomenal as Jen Van Meter, Roberto de la Torre, and David Baron. The Death-Defying Doctor Mirage is excellent work, plain and simple. The Death-Defying Doctor Mirage is a five-issue miniseries written by Jen Van Meter and illustrated by Roberto de la Torre and David Baron. Published by Valiant, the series will be collected in a trade paperback to be released in May of 2015.